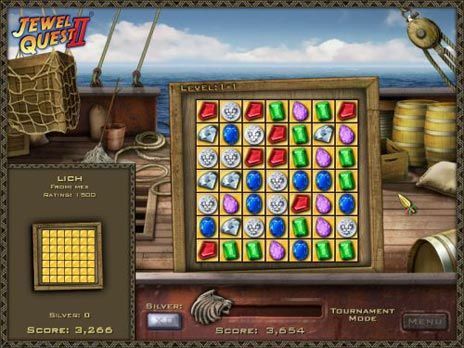 Download Jewel Quest 2 for free at FreeRide Games! 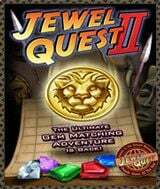 In Jewel Quest 2 - the second installment of the popular Match 3 game - we return to find Professor Rupert Pack devastated and heartbroken. The game begins with the revelation that after years of supporting him as he researched of the origins of the Jewel Board, Rupert's beloved Emma has left him for the wealthy and cavalier Sebastian Grenard. Inconsolable and searching for a serious distraction, Rupert sets his sights on the sea and joins the engine crew of a cargo ship en route to South Africa. Follow the professor in Jewel Quest 2 on thrilling journey filled with adventure, love and betrayal across the world's richest continent! Skillfully evade the menacing Sebastian Grenard while unearthing precious gems, and behold the dangers of the safari, the history of the Zimbabwe ruins and the majesty of Victoria Falls along the way. As you progress through the game, you must rearrange precious relics to turn tiles into gold in order to advance through relentlessly challenging puzzles and 180 impressive levels! So how does Jewel Quest 2 end? Does Rupert ultimately find the grand jewel board? Does Emma come to her senses and apologize to Rupert? Do they both manage to escape Grenard's Revenge? Play the game and find out! 180 challenging puzzles and boards. Discover 9 new jewels and power-ups. A thrilling soundtrack, gorgeous dynamic African backdrops and animation. Match skills against others in Tournament Mode.